For more than 100 years now, the Deutsche Höhere Privatschule Windhoek guarantees excellent academic education. Learners of more than 20 different nations learn together in the kindergarten, pre-school, primary- and secondary section. The learners are instructed by international teachers, who are pedagogically committed to each individual learner. The academical offer provides learners of different linguistic and cultural background the opportunity to pursue their individual educational goals and to achieve their aspirations in an increasingly international world. Bilingual training for all learners is an important advantage, which DHPS- school leavers are equipped with when they enter their studies or career. DHPS alumni study and work successfully in various fields in many countries in Africa, Europe and the rest of the world. In the primary section of the DHPS (Grades 1-4) about 350 learners are taught in sixteen classes. All Grades are divided into three German medium and an English medium class. The primary section adheres to the Baden-Wurttemberg curriculum with the focus on the class-teacher-principle. Educational programs at the DHPS enrich the curricular offer of internal and external differentiation as from the primary section. After school, our learners have the opportunity to play, craft or rest in our waiting class until 13h30. This service is offered free of charge. 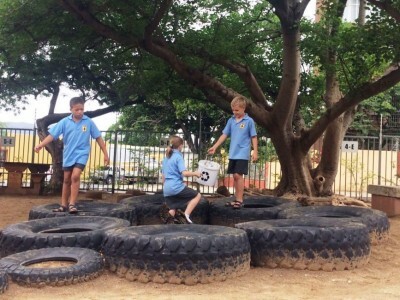 In addition, learners of the primary section can participate in a varied offer of extra-mural activities at the DHPS or can live and learn with their friends in our Child & Youth Center, our full-day supervision offer until 17h30. Of course we are in close cooperation with our pre-school and Junior Secondary section to guarantee a smooth transition between the different stages of school. Have a look at how we structure this internally. What can you do when a work assignment or group work has been completed in class? The learners of the DHPS primary section will surely no longer be bored! 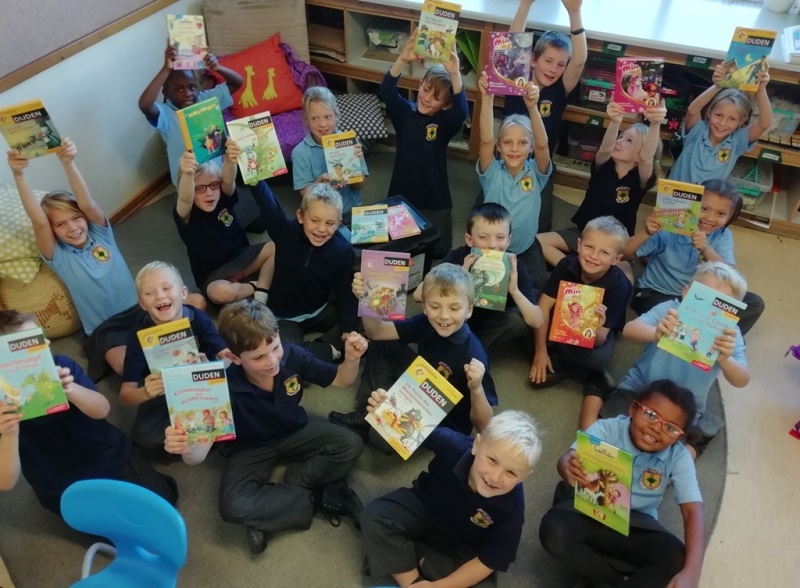 Thanks to the proceeds of a past Big Walk, primary school learners can keep themselves busy with the brand-new books of the book box in their class now. For each grade there is one book box that is intended for the use in the classroom only* and allows the children insights into many exciting stories in their free reading time. The selection of books that was chosen for the boxes was based on a book survey that was carried out last year. Of course, the contents of all boxes have equal values, so that no class is left out or even is unhappy! We hope that the learners of the primary section have lots of fun with the new books and enjoy reading! A big thank you again to the organizing committee, sponsors, parents and visitors of the Big Walk for the generous support! It's great to see what could be achieved by your help. * The books and the use thereof in the free reading time do not replace borrowing books from the library for home, but serves as an additional reading opportunity in the classroom. Finding a playmate on the school grounds sometimes poses a challenge to children. Sometimes they feel lonely and isolated in the complexity that comes with playing together and building relationships. In order to promote interaction on the school grounds, the DHPS has decided to put up a buddy bench. If a child feels excluded, cannot find his/her friends or wants to make new friends, he/she can simply sit down on the bench. A fellow learner can then invite him/her to play along or just sit down to chat. 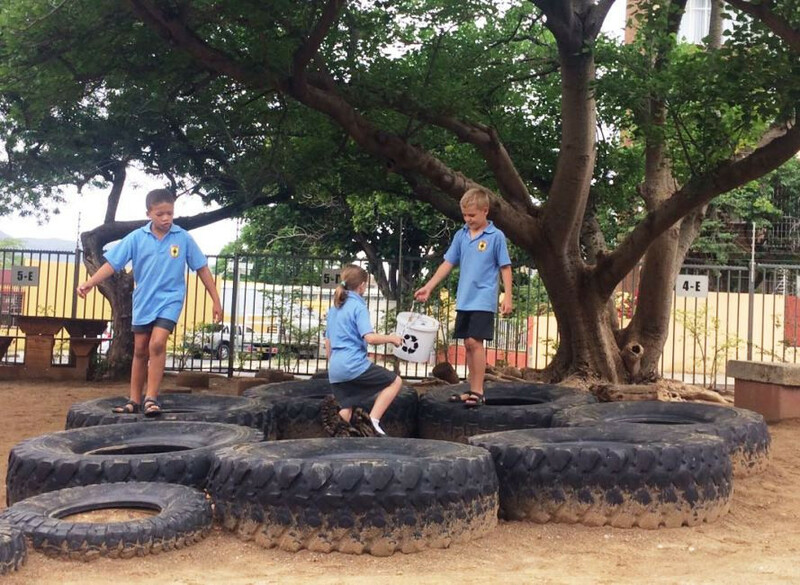 By mediating the purpose of the buddy bench and demonstrating to the learners, how they can use it to establish new relationships, we also provide an opportunity for them to develop in this field. In this way, the social skills and empathy of our learners are strengthened; they learn to solve problems themselves, pay attention to each other and respect one another. The bench is also a valuable tool from a pedagogical point of view, because it complements the social and emotional learning in the class room. We have placed the Buddy Bench on the playground of the grade 3 and 4 classes that the mentioned competencies are strengthened in the early phases of school development and the learners can further enhance them during their future school career. A special thanks goes to our art teacher, Ms Karin Hammer, who has designed this bench with her art group. 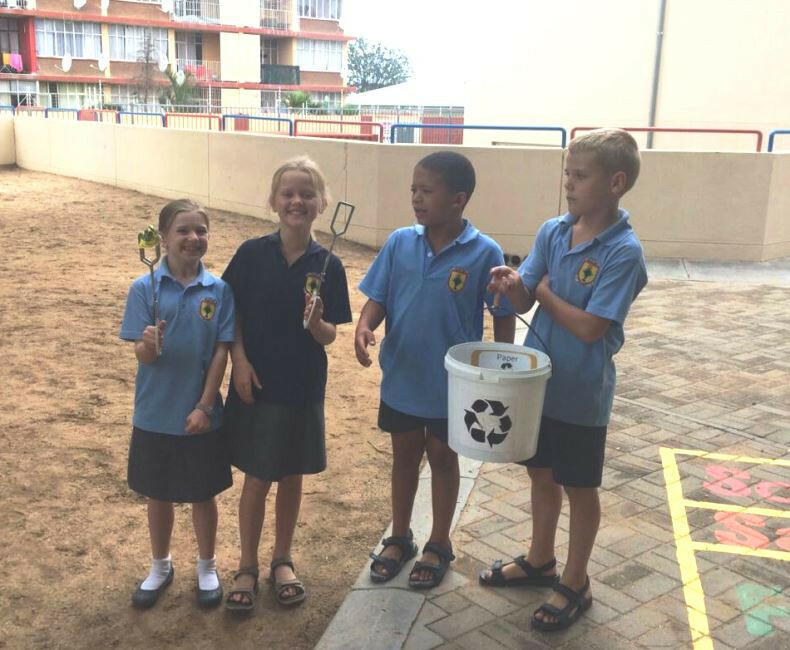 Joint effort for cleanliness: Our learners should take responsibility in keeping our school yard clean and tidy and become part of our clean-up project. 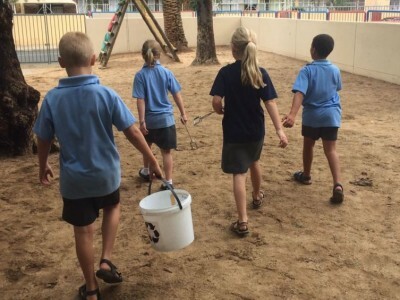 Weekly clean-up is performed on the playgrounds of grades 1+2 and grades 3+4. A sign on the classroom door is used to indicate which class is on duty and to remind children when it is their turn to clean up. 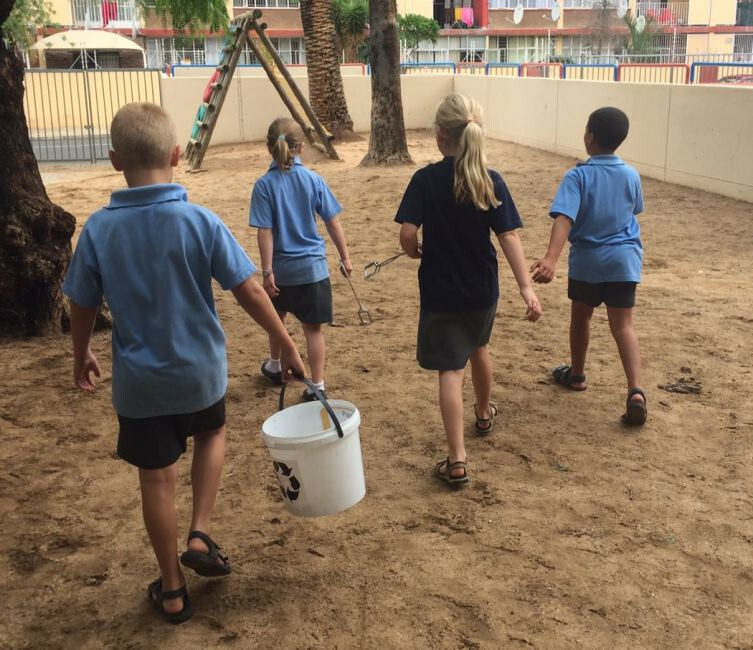 After breaks, small groups of 4-5 children assume clean-up duty on the playground. Areas included are the big playground, bordering playgrounds, as well as staircases. The children are equipped with a small portable dustbin and two rubbish tongs to pick up papers, plastic bags, etc. We wish all learners lots of fun and thank you for their efforts. 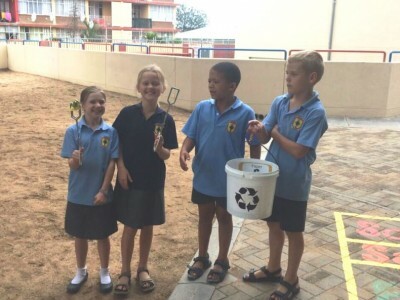 Let’s all work together, to keep our school clean and tidy! “Straighten up” is a postural exercise programme designed to raise awareness about the importance of back and spinal health. It also is a way to integrate movement-promotion into the school day. Through different forms of games and exercises, the back muscles are strengthened; posture, perception, physical abilities and skills are improved. Learners can learn better when learning processes are holistic. The more senses are addressed in classroom, the more effective the learning performance. Since February 2017, Dr. Drews and Ms. Nakamhela once or twice a week present the exercises in one of the Grades 1-4. Our teachers of these classes have been introduced to the different exercises and movements as well as to ensure regularity in lessons. Posters in the class rooms provide visual support. After each posture training session, children receive a stamp on their hand, to clearly show who participated in back-training, to show them that their spinal health is important and to remind them to "straighten up". On behalf of the entire school community we would like to thank Dr. Drews and Ms Nakamhela for their great commitment. We wish our learners a lot of fun and pleasure! With effect from 2018, we will commence with integrating the German and the English streams in the junior secondary section of the DHPS. This concept was developed to ensure the long-term viability and relevance of the school, to provide equal opportunities to all learners as well as to give further effect to the school’s mission statement with regard to being a school where genuine integration of cultures takes place. From Grade 5 (2018) our German and English speaking learners will be taught together - in some subjects, such as Maths, the lesson will be completely bilingual, some subjects are taught in German or English only. The junior secondary section comprises the German medium classes of Grade 5 to 9. There are usually three or four parallel classes per grade. Each class consists of approximately 20 to 25 learners. From 2018 on wards (starting with Grade 5/2018) all classes are taught bilingually. Subjects offered in the Junior Secondary Section are as follows; German, English, Mathematics, Physics, Biology, Chemistry, Geography, History, Economy and Administration, Computer studies, Technical studies, Religion, Ethics and Sports. In Grade 6 the learners choose their second foreign language: French or Afrikaans. The subjects Art and Music in Grades 7 and 8 are semester courses. In Grade 9 learners opt for either Art or Music. Computer studies is offered for one semester. Curricula of the junior secondary section are based on the German applicable gymnasium curricula of Baden-Württemberg, and have been supplemented by Namibian country-specific elements. The new curriculum offers "Hauptschul"- and "Realschul" learners the possibility to achieve these German school leaving certificates in Grade 9 or 10. All classes are offered a one-day methodology training. Excursions & adventures: The Grade 6 all learners go on a four-day excursion to NaDEET together, while in Grade 8 a four-day Grade excursion to Blumfelde is offered. Grade 9 classes conduct a one-week job-shadowing. At the end of Grade 9, parents decide on the future school career: either the DIA-branch (Gr 10-12) with the resultant Deutsche Internationale Abitur examination or the NSSC-branch (also Gr. 10-12) with the resultant Namibian Senior Certificate, the highest Namibian school leaving certificate. A wide offer of extra-mural activities supplements the compulsory lesson program. Participation in these activities is voluntary. The offer is re-organized on an annual basis. The Namibian Senior Secondary Certificate (NSSC) or the Deutsche Internationale Abitur (DIA). After Grade 9 NSSC or DIA learners opt for the NSSC or the DIA. The NSSC enables learners university admission in Namibia and in countries of the SADC region. The DIA is a worldwide recognized university entrance qualification. Please find here the detailed presentation on the DHPS school leaving certificates. At the Deutsche Höhere Privatschule Windhoek learners can opt for a bilingual school leaving certificate, the “Deutsche Internationale Abitur”. Mathematics is taught bilingually, German and English, while the medium for Physics and Chemistry is English. This certificate offers a globally recognized university qualification. The course comprises Grades 10-12. These are divided into an implementation phase (Grade 10) and the qualifying phase (Grades 11 and 12). During the implementation phase, subjects and learning contents and -methods for the qualifying phase are prepared. The Grade 10 certificate comprises the central exams in German and Mathematics, set by the Standing Conference of Ministers of Education and Cultural Affairs of the Länder in the Federal Republic of Germany (KMK). Learners continue with the second language, while they have the option to choose between Arts and Music. During the qualifying phase learners have two obligatory natural science subjects, but they are free to sign up for all three subjects. The qualifying phase (Grade 11 and 12) comprises four semester courses (11/1, 11/2,12/1 and 12/2), i.e. each subject is offered as a course with an end mark, which again is entered into the overall Abitur qualification. The choice of the 2nd and 3rd Abitur exam subject takes place in the middle of course semester 12/1 and is binding. As from Grade 10 the lesson medium in the NSSC branch is English. Learners can sign up for 6 subjects in “higher level”. German, English, French or Afrikaans and Mathematics. Physical Science, Biology, Accounting, Business Studies, Geography and Art (also as a main subject). In addition to these exam subjects, learners have arts- or music and sports lessons. A multi-faceted lesson and subject offer requires committed and versatile teachers – get to know our different departments! Accounting and Business studies are compulsory subjects in the English medium branch as from Grade 9. NSSC (Namibia Senior Secondary Certificate) -learners are thereby equipped to take a well-founded final subject choice for Grades 10-12. As from Grade 10 they can opt for either Business studies or Accounting; both are pre-scribed NSSC- subjects. Since the two subjects complement each other, one of the subjects may be chosen as the sixth subject, while the other one can be taken as the seventh subject. The final exam is taken during the NSSC - exams at the end of Grade 12. Both subjects can be taken on either higher- or ordinary level. All Grade 11 Accounting learners are given the opportunity to participate in the annual NSX School’s Challenge. They can thereby gain valuable insight into the operations of the Stock Exchange and understand the need of investigating a company’s performance, before hard-earned money is invested. Afrikaans is not only spoken in South Africa and Namibia, but also at international universities, like e.g. at the University of Vienna, Afrikaans is offered as a subject. In virtue of the European origin of the language (French, Portuguese, German) as well as the Asian and African influence, a wealth of vocabulary is offered, making the language a source of colorful communication. 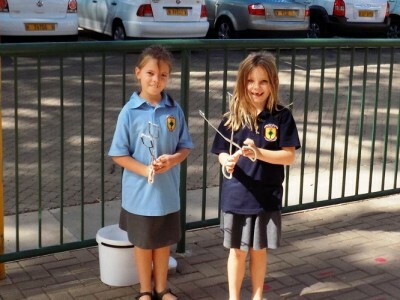 At the DHPS Afrikaans is offered as from Grade 6 at an advanced level right from the start. Lessons are enriched by numerous communication methods. NSSC Learners are thereby given the opportunity to choose Afrikaans at mother-tongue level or as a second language in Grade 10, while DIAP learners can opt for it as a second language. The Afrikaans department endeavors to acquaint the learners with the language in such way, that they have sound Afrikaans communication skills when they leave the DHPS after completion of Grade 12. A wide range of Afrikaans literature is available, which is employed in the lessons in an age-appropriate way and which is very popular among the learners. Art at the DHPS is offered as a two-lesson compulsory subject (up to Grade 6), a mandatory semester course (Grades 7 and 8) and as a compulsory elective subject (Grade 9 to 12 and Grade 12 DIAP). In each level, Art marks are significant for promotion to the next grade. Three spacious classrooms are available for the lessons, two of which are equipped with SmartBoards, which are used in all grades. In addition to the virtual homepage-exhibition, the learner’s artworks are regularly exhibited in the passage in front of the staff room, in the library and on the school grounds. For practical work, learners have lino cut tools, a mobile printing press, ink, a cutting machine, an assortment of papers, cardboards, coloured papers, pastel chalk, charcoal and other art materials, which go beyond the basic equipment, to their disposal. How is Art taught at the DHPS? Perception and creation are the two components of Art lessons. These activities are equivalent and closely interlinked, they complement each other and shape the subject in its specific entity of reception, reflection and creative production. Historical and current phenomena of art and culture are always seen in regard to individual creations. Creativity, association ability, imagination as well as cooperation and mutual tolerance are basic skills that are taught in Art. Pictorial tasks allow for differentiated solving and challenge divergent thinking. Above all, it is important for us to stimulate, preserve and promote the pleasure in creating and in artistic expression. The Biology department comprises motivated, cooperative colleagues, who engage their learners in the excitement for biology in a fun-filled, enjoyable and collaborative way. The internal school curriculum of junior secondary level has been compiled with close reference to the 2016 education plan of the Federal State of Baden Württemberg. Grades 5,6,7 and 9 are taught once a week in a double period. diversity and ecological significance of various vertebrates, invertebrates and different flowering plants. The visit to the bird rehabilitation centre Narrec or a rally through Windhoek's botanical garden makes the newly acquired knowledge more tangible to the learners. The school is equipped with great microscopes, which learners enjoy using frequently. Structure and function of different organ systems and basic procedures of human development and reproduction. Learners acquire knowledge through independent and practical work in work stations and by application of a large diversity of methods. They acquire competences in the three process-related areas of knowledge “knowledge acquisition", “communication “and “evaluation”, which aim at the successful and responsible management of tasks and problems. Knowledge, skills and abilities for their own actions are thereby interlinked. In grade 6, learners are given the opportunity to visit the NADEET environmental education centre for an entire week. With a versatile and well-organised programme, sustainability and adaption of various organisms to desert life are the focus of the excursion. This week is an unforgettable experience for all learners. -In the secondary section, focal topics are metabolic physiology, genetics and genetic engineering, neurobiology, ecology and evolution. Through various internally differentiated teaching methods, the department manages to arouse the learners’ interest for different biological topics and make them understandable to them. In grade 11, a one-week desert excursion to the Gobabeb research station is offered - a great experience on the topic of ecology. These are only a few examples on how method diversity can stimulate pleasure in the subject. It is advisable to develop the assessment criteria in consultation with the learners or to at least introduce them in an understandable way. Wide-ranging achievements in Chemistry have significantly contributed to the prosperity of modern society. Progress in this area improves the life quality of millions of people: Development in different fields like medicine, agriculture, food production and energy economics is thereby enhanced, and it enables inexpensive production of durable everyday objects. The objective of Chemistry lessons is to provide an introduction thereby increasing the dialogue on Chemistry, which is an innovation driver and indispensable component of everyday life. Unquestionably, experiments play a key role and serve as a motivation for learners. Contemporary tuition explains Chemistry contexts in every day life, technology and the environment by means of a systematic approach, knowledge acquisition and technical language. Independent activities and learner experiments are of great importance and are facilitated by well-equipped laboratories. Therefore, an integral part of the lessons is group and partner work, to enable learners to establish a direct connection to their perceptions. Parents are amazed when their children acquire technological skills faster than they do. However, communication in the digital age offers a lot of advantages: it specifically promotes receptivity and motivates children to learn. At the DHPS Computer Studies forms part of the curriculum as from Grade 2 already. The main objective is IT-skills acquisition with the European/International computer driving license (ECDL, ICDL). This certificate is recognized in 148 countries and certifies basic IT-knowledge. More than 1500 educational institutions worldwide (including the DHPS) offer EDCL courses. The units are diverse, ranging from basic Excel to word processing, presentations, image processing to data bases and HTML design. DFU is when learners, whose mother-tongue is not German, are taught subjects in German. DFU should not be confused with bilingual lessons. One of the main objectives of a German school abroad is transmission of German language. Learners, who acquire the German language are given the opportunity to bond with the German country, culture and people. This connection also serves to reflect on the learners’ own language and culture. DFU deepens German language skills, making it a real communication medium, which directly benefits the DaF. The DFU is used to enhance the communicative and cultural skills of learners and should benefit the integration of foreign language learners at the DHPS by means of additional lessons in the German language. Which subjects are taught as DFU- subjects at the DHPS? At the DHPS Geography and History are taught as DFU-subjects. Grade 7: after introduction and sound knowledge acquisition of important grammatical structures, such as tenses (past tense), history is added. How is DFU offered at the DHPS? German medium lessons involve subject and language instructions at the same time, i.e. factual contents and language acquisition and -practice are combined. Such teaching not only requires language-focused tuitions, but also a high degree of internal differentiation to meet the needs of the different linguistic requirements of a specific learner group. At the DHPS we endeavor to meet these requirements by means of special teaching methods. These include i.a. Possibilities to exercise and apply new vocabulary by offering written and oral actions. At the DHPS, English is taught at a predominantly advanced level in order to cater for the various school-leaving levels and certificates offered here. In the NSSC branch, English is taught as First and Second language level, although most students choose English as a First language, as this choice offers more opportunities for the future. Many university admissions require students to have passed English as a First language at school. In the DIAP branch, English is offered as first additional language. These studies include the critical evaluation and analysis of topics of global concern – and the description “foreign language” is an underestimate for the level that is maintained in this branch. Our aims are to build a strong foundation and provide a rich language for all - through listening, viewing and reading, speaking, interacting and presenting, by writing and discussing, through grammar and vocabulary. a contextualized and holistic approach to learning that will provide a rich language environment for developing language skills, grammar and vocabulary. a greater focus on oral communication (listening and speaking skills) using show-and-tell, debates, speech and drama, and oral presentations for all levels and courses. The goal of French classes is the development of the pupils’ ability to communicate and act in an intercultural surrounding, in other words the development of understanding and using the language in everyday situations. Knowledge and insights into the subsystems vocabulary, grammar, pragmatics and regional and cultural studies as well as their implementation and use in the fields of listening and reading comprehension, speaking and writing serve to reach this goal. In 2015, we started the first step of a school exchange with the Cité scolaire de Munster, in Alsace (France). After 5 days in Paris, the Grade 9 learners were welcomed by their host families, where they spent two weeks and shared their everyday life. The goals of this project are to share the French culture and to improve their French language skills. Such a trip gives motivation to the students when they start French in Grade 6. We should receive the French students in 2016. Our aim is to go to France each year with the 9th Grade. During the year, the French Department organizes or is involved in different activities, such as the Francophonie day or a French week-end with other schools. From 2011 all pupils of grade 9 and 10 prepare for the language diploma DELF (Diplome d’études de langues étrangère). Examination takes place at the FNCC for levels A1, A2, B1 and B2. Preparations for the exams in senior secondary level continue as extra murals. Are geography, regional- and world-studies the same? What are the similarities and what are the differences? This question cannot be answered clearly. Geography is a school subject, where wide-ranging world studies are taught. Depending on the country and type of school, different aspects of Geography are taught, such as geomorphological topics like plate tectonics or economical geography. Regional studies is the general term used for analysis of individual states. Regional studies, being part of Geography lessons, entail finding and/or describing specific places or regions. Although this procedure is an important part of general education, it has nothing or little to do with the complex science of Geography. Geography is a complex science that deals with the features of the Earth. Depending on the orientation, Geography is a natural science (physical geography) or a social science (human geography). Geography comes form the Greek geografia and is translated into English roughly by “drawing the earth”. The German language plays a major role at the DHPS from the kindergarten up to a successful school graduation. For us it is important to also promote non-German mother tongue learners and to facilitate sound language skills. German kindergarten, special language promotion up to the German language diploma - everything on the topic of German as a Foreign Language is available here. Module lessons (split lessons) for individual support in numerous lessons as from Grade 3. The DSD II certifies that learners have a high command of the German language, which allows them admission to German universities. Speech competence and communication, German as a gateway to literature and a tool for observing the world, cultural and aesthetic education are important to us. What is taught in German lessons? In the lower grades the basic objective is oral and written German language acquisition, text comprehension and interpretation as well as reflection on the language. We discuss and argue, encourage independent thinking, question and develop own ideas and opinions. What makes German a very special subject? The above learning contents and priorities are used to develop our learners’ personalities by holistic tuitions. Especially in the subject German, interdisciplinary work by means of projects and global topics has priority. We thereby encourage creativity in thinking and writing and by means of reading- and speech competitions we demonstrate the great variety of expression possibilities. Application and analysis of modern media obviously have become integral aspects in the subject German. History is the biography of mankind. History lessons at the DHPS serve to develop awareness for history, namely, finding a historical meaning for orientation in the past, present and future. Dealing with history should serve as a basis for our present and future actions. The basis for this is acquisition of skills and competencies, i.e. specific forms of a mental quest for history and historical awareness. In addition, in history lessons cross- subject skills are promoted, e.g. the competency for obtaining and processing information, presentation -, social- and personal skills. At the DHPS history is taught as from Grade 6. VIP visit at the DHPS: Markus Meckel talks about history of the GDR and German reunification. Please see Support Programs for further information and details. "What do we need that for!?" Quite honest, who of the adults has ever used the quadratic formula after school ever again? Who has determined the intersection of two planes? Who has turned a triangle around by 40º? No-one? I thought so! So why do we do things like that in classroom? What is Maths good for? You might not need extractions of roots after school ever again, but when you understand, how and why it is done, you have acquired a lot that might become useful later. When Mathematics expands the learners’ horizons, it becomes one of the most exciting subjects. Compared to German schools, media employed in the Mathematics department are state-of-the-art. The SmartBoard and the specially developed software are applied throughout. Learners and teachers can write down conventional calculations here, present prepared topics, construct geometric shapes with digital compasses and triangular protractors, solve systems of equations with computer algebra systems, design three-dimensional figures and simulate solutions of equations of varying levels of difficulty. Further programs, which are used, are conventional Office-packages as well as mathematically-oriented SmartBoard plug-ins, simulation programs of calculators employed in lessons and online-learning platforms. Music at the DHPS is offered as a two-lesson compulsory subject (up to Grade 6), a mandatory semester course (Grades 7 and 8) and as a compulsory elective subject (Grade 9 to 11 and Grade 12 DIAP). In each level, Music marks are significant for promotion to the next grade. Two well-equipped music-rooms with a large variety of small percussion-instruments for all learners of each class are available. In addition, the school has drums, keyboards, a grand piano, electric guitar, bass guitar, amplifier and mixer. How is Music taught at the DHPS? Music lessons at the DHPS are divided into three fields of competencies, which are integrally connected to each other. Learners gain experience by playing music and by their individual musical creativity (singing, performing music, movement), i.e. by their own actions they are guided to skills and they via their knowledge they then acquire terminology. Joy in music is awakened, preserved and fostered. Learners are taught to listen consciously and to perceive musical techniques and their effects. They communicate via music (for which the language of music, i.e. the ability to deal with musical notation and musical text, is essential). Learners reflect the significance of music in various historical, cultural and social contexts and also for their own life. They consciously experience and reflect the emotional effect and are able to apply criteria for music evaluation. Music however is real fun as soon as it is lived and experienced, when musicians achieve success, perform on stage and have overcome their initial stage fright. Whether our brass band, the orchestra or learning to play new instruments - nearly no limits are set to the possibilities and offers at the DHPS. Physics can be so much fun! New phenomena demand new explanations from us, these are tested, whereby again new phenomena arise (does it ever stop? ), and so on. With success and with time, more comprehensive explanations occur, so that many phenomena can be described with only a few formulas. Physicists also are not fond of many formulas, they prefer concise, reliable and clear formulation. This is the origin of Physics and our tuition is designed according to its occurrence, from the natural phenomenon towards a powerful theory. In Grades 7 and 8, Physics classes are still directly connected to the learners’ observations and experiences, whereby the joy in exploring nature is transmitted by simple experiments and questions. Thereby they learn to examine phenomena from their environment by precise observations and detailed descriptions. In Grades 9 and 10 a systematic approach of describing nature will gradually become more significant than personal experiences. Key concepts like energy, condition and force take priority and increasingly replace pure phenomenology. Amongst others, we use the mentioned terms to demonstrate the scope of physical explanations. In Grades 11 and 12, topics are nearly restricted to two themes exclusively, two theories, by means of which everything else can be explained: fields and waves. Acoustics, optics, mechanics, electricity, magnetism - everything can be described logically in terms of these theories. This requires a high level of imagination. And at the DHPS this is exactly where we guide our learners to during Physics lessons - step by step. Religious instruction at the DHPS is open to all learners of different confessions and is ecumenically aligned. It thus contributes to common understanding within plurality and aims at verifiable skills and contents, while faith itself is also assessed. Children and adolescents are accompanied in their search for orientation and meaning in life and besides being informed about the Christian belief and its traditions, they are brought into contact with faith as an attitude, approach and way of life. Religion lessons open their eyes for the Christian character of our culture and introduces them fundamentally to the biblical and Christian tradition. Like in Ethics lessons as from Grade 8, learners deal with different sense- and meaning propositions and are instructed to develop and to voice their own opinion. Hermeneutic skills as the ability to understand and interpret references of past and present generations and other cultures, especially of biblical texts. Ethical skills as the ability to identify ethical problems, to analyze, to develop alternative actions, evaluate proposed solutions and support the own judgment, in order to act responsibly at that basis. Subject skills as the ability to supply information on religious issues and to identify their significance for our culture. Social skills as the ability to perceive other people and oneself sensibly, to listen, to seek solutions for conflict together and to develop mutual initiatives. Methodological skills as an ability to capture tasks, disclose the contents, organize learning processes independently and to present the results. Aesthetic skills as the ability to sensibly perceive art, cultures and traditions and become creative. Social studies lessons are of particular importance at the DHPS. Since secondary section learners also have Religion and Ethics classes at our school, Social Studies lessons link political education with basic social competencies and value orientations which are necessary for coping in our increasingly complex world. What are the distinctive characteristics of Social Studies lessons at the DHPS? Consideration is given to cross-subject aspects, which relate to basic orientation skills of our modern world and are usually assigned to subjects like Geography, Economics, Psychology, Religion, Philosophy or Ethics. Therefore it is necessary to anchor skills, which enable active participation in the political, social and economical field. In addition to the parents, it is mainly the school’s task -specifically in Social Studies- to encourage and promote the process of political education. Based on the stipulations of the German and Namibian constitutions, Social Studies at the DHPS provide an important contribution towards teaching values and standard guidelines in political education. What is important to us in Social Studies classes at the DHPS? Lessons should enable learners to gain an insight into political, economical, social and legal contexts and to form a rational and competent opinion. Participation and involvement in political processes is subject to specific skills acquisition. These skills are interdependent and complement each other and also contribute to the ability to study. Such competencies are implemented in the respective grades in an age-appropriate way with increasing complexity and differentiation. Annually offered excursions - e.g. to Katutura - support contemporary relevance of the subject and promote reflection of the learners’ individual living environment. The DHPS has multi-faceted sports offer! Beach volleyball, athletics, ball sports or swimming- thanks to the mostly sunny weather no limits are set for sports at the DHPS. a double gym - TO BE RENOVATED 2017/18! The DHPS primary section regularly participates in Zone B athletics competitions with government schools. Here athletes can qualify for regional and then for national competitions of the NSSU (Namibian School Sports Union). The DHPS participates in the national inter-school swimming gala. Annual swimming galas are held for Grades 5&6, 3&4 and 1&2 at the DHPS. In addition the youth athletic competitions (Bundesjugendspiele) for Grades 1-6, the Volleyball day for Grades 7-12 and the athletics championships for the primary and secondary sections are held at the DHPS annually. The DHPS and the four German private schools of Johannesburg, Pretoria, Hermannsburg and Cape Town organize a biennial Sports Olympiad. When taking a closer look at Namibia’s educational environment it becomes evident: This is no mainstream subject. At the Deutsche Höhere Privatschule (DHPS) , besides academic education, emphasis is put on developing craft skills and -abilities. Technical Skills is still offered as a subject, comprising metal-, wood-, ceramics and textile work as well as pottery. Technical Skills at the DHPS is a practice-oriented subject comprising four subject areas, namely woodwork, pottery, metal work and fashion and fabrics. All four fields have hands-on, practical and aesthetic contents. In Grades 5 and 6 Technical Skills is taught in four semester courses ( three lessons a week) in the fields of woodwork,pottery, metal work and fashion and fabrics respectively. A special rotation principle is applied here. Two parallel classes are divided into three groups, who are then each allocated to one of the areas offered. In Grade 7, learners choose two more detailed semester courses for further deepening in two of the fields offered. More than 65 countries, over 900 schools worldwide and about 51.000 participants each year are representative for the success of the German Language Diploma (DSD). We are extremely proud that also in the English medium classes at the DHPS, the German language diploma is offered. The DSD I (B1) entitles to admission to a preparatory college in Germany. The DSD II (B2 / C1) entitles (considering the results of the NSSC-exam) admission to a German university or high school. No additional language examination in Germany is required. The DSD is free of charge for DHPS learners and has lifetime validity. The DSD improves job opportunities, because even in Namibia German speaking professionals are highly sought after. Every child learns differently. But those who experience success enjoy learning. This is the objective of the DHPS support center, therefore individual support has high priority. For us it is important to meet the child concerned with his/her abilities and deficits at the present stage. Exercises in small, manageable steps offer the child the experience, that he/she also has basic skills in the dyslexia/dyscalculia section that can be used in the learning process and for further development. How will the needs be determined? The dyslexia/dyscalculia lessons are usually offered for Grade 3-9 learners (in special cases also in Grade 2). If reading-spelling or maths disability is suspected, the teacher informs the parents and the school psychologist. The discussions and subsequent report are the decisive factors for participation in dyslexia/dyscalculia support lessons. For the teacher this serves as the basis for targeted training and an individual support program, which includes varied, changing methods and application of different materials. Lessons are offered in small groups in the morning and charges apply (refer to DHPS fees structure). improvement of reading-, spelling-, and numeracy ability. The support applies to the most important conditions for learning like e.g. on the section of reading, writing and arithmetic. Supplementary instruction is a special language promotion program for non-mother tongue German children in the German Gr.1-4 classes. The learners are supported in their linguistic perception, written language acquisition, reading and spelling. For this the primary orientation lies in the German homework, to establish transparency and consistency with regular German lessons. Learners are supported in their work and they are given corrective feedback. To work with the children individually and specifically, regular exchange takes place between the educators, class teachers, day-care centre and hostel educators (if applicable) about the needs and progress of each child. "Every child is different. Every child has different abilities. Every child learns differently." 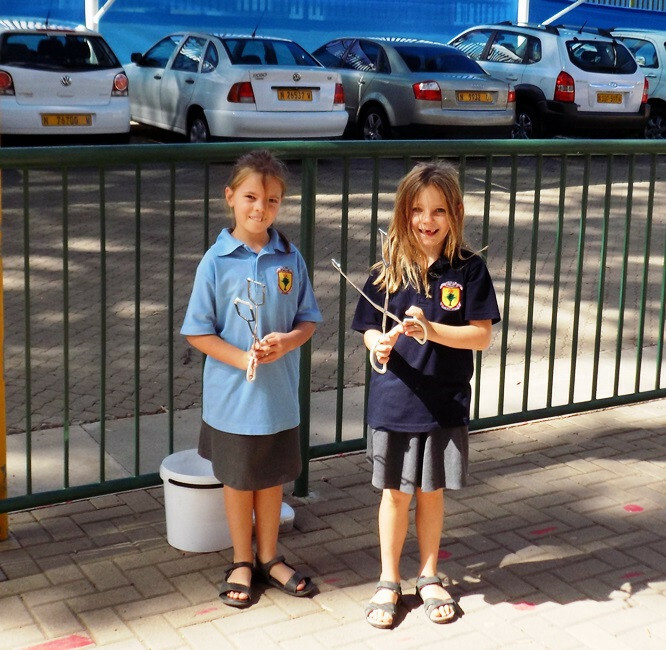 It is the objective of the primary section, being the first joint school for all children, to support and enhance the children in their individual learning- and development requirements, to develop independent thinking, learning and working. In addition to many other remedial offers at the DHPS, the program “support and enhancement”enriches the educational offer of internal and external differentiation. This is done by learning aids for learners or for groups during lessons on the one side, and by extra-mural, additional remedial lessons. During remedial lessons learning difficulties can be solved, an advanced level of difficulty can be offered for good performers and working in small groups is possible. Remedial lessons is an optional offer of the school for Grade 1-4 learners, in consultation with the relevant teacher for a certain number of children. Sports coordination training and motor skills promotion are sports programs for the promotion of motor skills and abilities of children in kindergarten as from 2-3 ears and children in Grade 1 and 2. Particular emphasis in these coordination programs is on holistic development and physical endurance in conjunction with concentration. Strengthening the social and motor skills as well as an improved ability to concentrate through specific sports coordination exercises! Ms Hannah Reusch is a professional psychologist at the DHPS. Ms Reusch provides advice to parents and teachers in cases of learn difficulties, emotional and behavioral disorders or problematic social interactions. This includes support in difficult life situations and referral for further (therapeutic) actions as well as lesson observations and consulting in conflicts and disciplinary cases. In the primary section, Ms Reusch is in charge of the social skills training. She assists in the school entrance observation procedure and conducts admission interviews with new learners. To make an appointment, please feel free to contact her by e-mail or call her during opening hours (Tuesday - Thursday 7h00 - 7h40). Being a German school abroad, the DHPS is a school of diversity: Learners, teachers and staff originating from different cultures, countries and mother-tongue work and learn together every day over again. Thus, we also attach importance to unrestricted access to education. On these pages you will find out more on how this is concretely lived out at the DHPS. in all sectors of society. Inclusion in education and learning primarily means equal appreciation for all learners and staff, as well as to increasing participation of all in culture, teaching subjects and the school community. We attach importance to responding to the diversity of our learner community and to overcome learning- and participation obstacles. By projects and by overcoming barriers, we strengthen the view that differences between learners are not problems that need to be solved, but opportunities for life. The significance of inclusion in schools, education and teaching and thus the intention to build communities, develop values and improve performance, is the beginning of inclusion in society. How does inclusion at the DHPS look like? What does inclusion mean for our school? What changes by inclusion? An inclusion community provides diverse developmental and learning opportunities. Children in joint classes mostly achieve better results and also learners with special talents can be promoted in mixed ability classes. In addition, social skills of all learners are promoted and self-concepts of the children are strengthened in joint classes. It is clear, that inclusion is not only an advantage for children with special educational needs, but that all children benefit from inclusive education. What does school development involve? The focus is on the well-being of the learners and their capability to act independently and maturely. The overall objective is the school's mission and the ability for autonomous, responsible action and decision. Society and co-existence is always changing and the demands on children and adolescents in a globalized society are becoming more challenging and complex. Emphasize cannot solely be on the impartation of knowledge, since knowledge is constantly changing. The intention is to teach skills to enable learners to solve problems. Schools need to meet these requirements. School development is a vibrant process that is never completed and therefore frequently requires new measures to be taken. The steering committee consists of representatives of all school committees: School management, school board, teachers, SRC, hostel, parents, section representatives, representatives of all working teams. At our school we have trained propagators of the issue of cooperative learning. Under their assistance, teachers are comprehensively trained for these forms of tuition. Training is offered each year school internally, for the entire teaching staff (and partly also for the administration,) as well as regionally. This training contributes to the development and implementation of school development measures. At the DHPS, since 2010, so-called professional learning groups (PLGs) have been established. All colleagues are involved; they are organized in teams and deal with different topics. Have a look at the department German as a foreign language. Any further questions on PQM at the DHPS? Apart from regular school-specific training seminars (SchiLF-meetings), the findings of three SEIS+ studies (2006, 2007, 2013), one study by the Namibian Ministry of Education (2006), a Peer Review (2016) and the BLI 2017 serve as the basics for development at school. Exemplary measures taken: remedial concepts, New Grade 8 E, German language concepts (DaM/DaF). Teaching teams, cross-cultural grades, joint competitions, outings / school trips lasting several days (Blumfelde) for team building in a complete grade, Bazaar, mediation programme, values education, prevention of addiction, environmental education by means of school trips (Nadeet), work experience, numerous special interest groups at school, independent learning. The mission statement is the basis of our educational programme which was adopted in 2010. Every year so called SchiLF- training seminars are organized for all teachers (and for the administration at times) which contribute to the development and implementation of school development measures. Since 2009 cooperative lesson observations have been conducted at the DHPS. In July 2010 a Pedagogic Day was organized for the implementation of methods pertaining to cooperative learning. This was supplemented by the integration of all teachers into teaching teams who discussed lessons together and conducted cooperative lesson observations. Regional training 2017, Pretoria: "Kindergarten & Primary school: Learning German successfully and organising a good transition"